Rescue Team 6 is rated 3.6 out of 5 by 21. Rated 5 out of 5 by Reny9857 from Good Game! I enjoyed playing this game! It had some good challenges that made you think and plan a strategy even in relaxed mode. I also have versions 4 and 5. Each version higher seems to have more challenges which is something I like. In my opinion, if it's too easy or too hard, it's no fun. This was a good mix for me. I hope there will be a Rescue 7. Thank You! Rated 5 out of 5 by rvacs from PLEASE continue the Series - LOVE this game!! This version is very improved over older ones in the series. I love the game play and like more active type games vs. other time management games. PLEASE continues these. Rated 5 out of 5 by Mazou884 from A nice surprise I play a little bit of every genre. For TM games, I have enjoyed mostly the Delicious series, in good part because of the story. I find that many TM games become either repetitive, easy or impossible, sometimes too short. Got Rescue Team 6 over the holidays, never played that series before, and now I feel like it was custom-designed for my total enjoyment ; ) The graphics are clear and well done (with cute dogs and meowing cats! ), even the sounds are so varied that they do not feel repetitive. Appropriate dramatic or island music. Love the lining-up tasks option and that we can first look at at level to plan a strategy before starting it. To get all three stars, some levels do require more planning, but the game makes it easy to start over. I did find the burning fires and the hub type levels quite challenging. But there was always a specific strategy that worked in the end, like following a certain order in picking up things or, often, constructing a type of building at the beginning of a level only to demolish it later to build something else as needed. Overall, this turned out to be a great TM game, which I'll enjoy replaying often as there is a lot to do and think about. My congratulations to the dev. team. Rated 5 out of 5 by magbrad from Fun, fun, fun This was the funnest so far of the Rescue Team series. There were several levels that stumped me and I even had to go on line to watch walk-throughs. I really liked this. Wish it didn't have to end, but certainly the number of levels was very fair. Rated 5 out of 5 by flushstar from It's really cool to play! This game is intense and fun so you won't be bored as there are a lot of new in this part . Rated 5 out of 5 by AMisug from Oh) This is my favorite and i played the whole RT series games. This game has an unusual mechanics and you need to think about how to pass every level. This is a real time management game! I played with pleasure and i think you'd like it also. 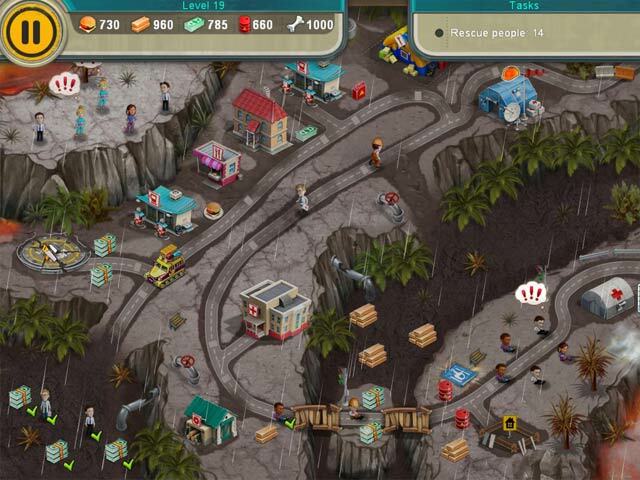 Rated 5 out of 5 by JoelCarter23 from This is very exciting game I like the goal of Rescue Team series. It's very exciting to save all people) This part contains new additions like the shop with various items, new zones and personages. What I found great here is that you may save people using dogs. And this part has better graphics than others. I recommend Rescue Team 6! Rated 5 out of 5 by pennmom36 from Rescue Team vs Mother Nature I love Rescue Team Time Management games because they are unique and so different than most other TM games. I didn't see a lot of value in the Collector's Edition version, especially at that price point, so I was glad to see this Standard Edition released today. There are three modes of difficulty available, Normal (allows you to assign tasks only when a worker is available) Multi-Click (allows you to queue several tasks until a worker is available, and a Relaxed mode (no time constraints) The goal is to earn 3 Gold Stars for each level, and any level can be replayed to achieve a faster or better star score. 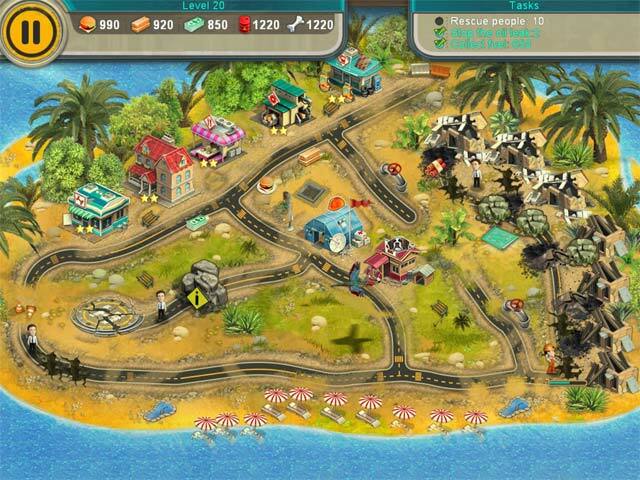 There are the usual tasks to complete like most TM games, collect resources such as food, money and wood, clear roadways of debris, fix potholes, and repair bridges and damaged buildings, and strategically construct sawmills, food establishments, mines and other establishments that will produce the required resources. 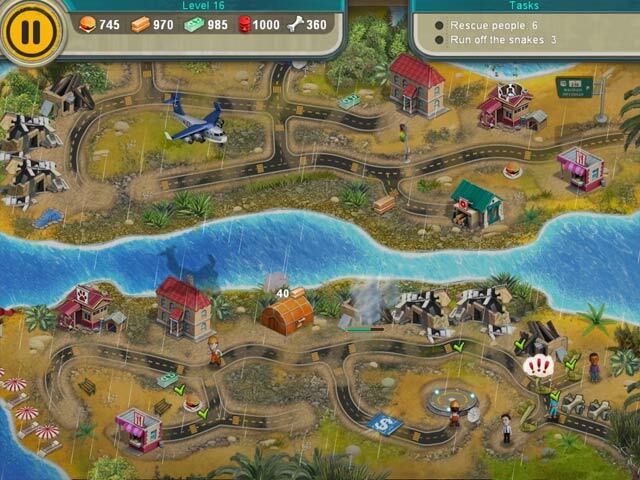 Because this is a Rescue game however, it's all about rescuing people from natural and manmade disasters. 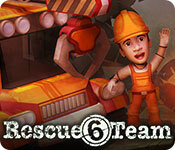 In Rescue Team 6, an earthquake has injured and trapped several people in a gorge, and the team must clear a path for the search and rescue dogs, Barry and Larry, to search the debris for people. People aren't the only ones that need rescued, you will be tasked with rescuing cats, dogs and other trapped or endangered animals too. You need to construct buildings, sometimes in a specific order because Houses will earn money, Sawmills provide wood to repair and reconstruct, Burger Shacks provide food for the workers, Hospitals provide doctors to treat the sick and wounded, etc. I always recommend planning a strategy before clicking on anything, you will be able to see most of the area on the field, and the timer doesn't begin until you click on the screen, so read the tasks list and at least plan the paths of least resistance. Not every road needs to be cleared to achieve the goals, but some roads may provide beneficial resources. The Collector's Edition has 9 Concept Art pictures, 19 Collectible Stickers, 6 Character Biographies, 33 Achievements, a built in Strategy Guide and Bonus Levels. Rescue Team is a really good Time Management series that has different features offered than most TM games, I personally just don't get why a CE is necessary for this type of game so unless you really want to download some wallpapers and get a few extra levels, this edition is the better value, enjoy! Rated 4 out of 5 by playerRoxie from Love this series :))) I read the reviews and have to agree that, yes it's not as good as the previous games in the series; yes, in comparison the graphics are a bit disappointing and the gameplay a little less varied; there are a few badly designed elements like things you have to attend to obscured by your Taskbar... I was in fact a bit disappointed when opening the demo and thought the graphics seemed to be going backwards. And yet, I have played it twice over (Timed then Multiclick). Love this series!! I had much the same reaction playing the demo of the first, thinking "this looks awful".. but got totally hooked in the gameplay. It's become one of my favourite series, there is so much going on - buildings, roads, bridges etc. to repair, obstructions to remove, fires to put out, gas leaks to switch off, resources to fish and buy, robbers to fend off, and of course people to save - by plane, boat, truck, rescue dog, medic... Sometimes from multiple bases so you have 2 or 3 camps of workers going on at once. While the graphics may be a bit boring, they are constantly animated - the people are moving, rain is falling, fire is flickering, mist floating, bobbing in the water, etc. This game also has a shop where you buy upgrades as you go (your coinage depends on how many stars you finish with at each level). I hope I'm not making it sound complicated, it's really not - actions just don't feel so repetitive when you are doing a different thing all the time - way more fun than the standard fare of most TM games. The level of challenge is a bit easy, especially when you know the best strategy, tho' I had to play a few levels 2 or 3 times to figure out what that was. This "one-of-the-worst" is still WAY better than many of the TM games on offer. BF - more of these please! !